In April 2016 Yale University hosted the eighth United Nations Global Colloquium of University Presidents focused on cultural heritage and preservation. As part of the activities planned for this event ancient art and objects from Yale’s collections were on display at a large open house exhibit at the West Campus Collections Study Center. NELC faculty and Babylonian Collection staff (Benjamin Foster, Karen Foster, Agnete Lassen, Enrique Jimenez-Sanchez, & Eckart Frahm) participated actively by showing and explaining items from the Babylonian Collection, and related to the Cuneiform Commentaries Project. 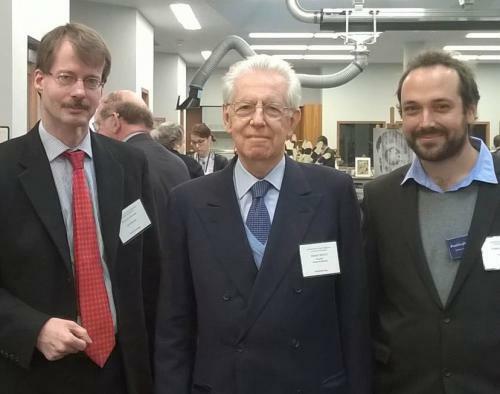 NELC Postdoctoral Associate Enrique Jimenez-Sanchez talked at length with Mario Monti, President of Bocconi University, Milan, and former Prime Minister of Italy.